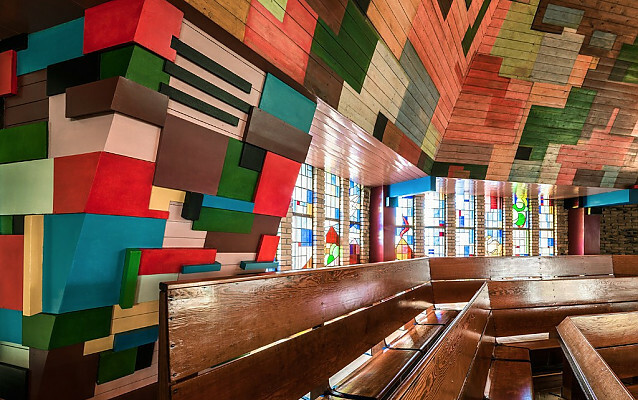 If you associate Reformed church buildings with austerity, the church in Andijk, the Netherlands, will surprise you: designed by the Groningen architect Egbert Reitsma (1892-1976) and completed in 1930, it is an exceptionally expressive construction, both inside and out. Reitsma’s unusual ideas about space, use of materials and colour struck a cord with his fellow believers. This may be partly caused by the fact that at the time the Reformed section of the population was at the peak of its social influence, which went far beyond its numerical presence. In the religious landscape of the province of Noord-Holland, where liberals and Catholics dominated apart from a – for those times – fairly large group of unchurched people, Andijk formed a Reformed enclave, where bulb growers set the tone. They were very prosperous, so that a generous budget was available for a complex of church, meeting rooms, rectory and caretaker’s house, at least during the design phase in 1928-1929. The international economic recession that had begun with the stock exchange crisis in New York in 1929 adversely affected the export possibilities for the growers in Andijk and hence the execution of the plans. It was the tower that would have fallen victim to this unforeseen setback, if the architect had not proposed a series of budget cuts. In consultation with the commissioning partners he even offered not to charge his honorarium for the tower and to donate one thousand guilders in order to realize his architectural dream. It is very likely that in the end the savings were made principally in the materials, with the result that in the long run the quality of the concrete construction left a lot to be desired, as the investigation prior to the recent restoration of the building (2015) suggests. 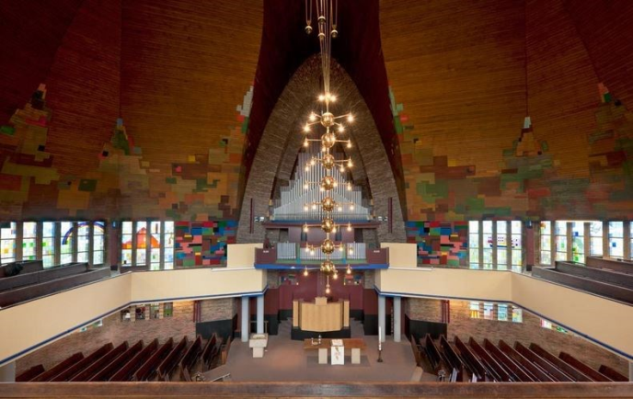 The design surpasses all other church buildings realized by Reitsma during the 1920s, both in scope (seating for 1200 people) as well as in architectural execution. The architect made the most of the somewhat ex-centric location in the village, not far from the former Zuiderzee (originally Holland’s inner sea, now a large lake), by providing the building with steep roofs and a slender spire, whereby it can be seen from afar. 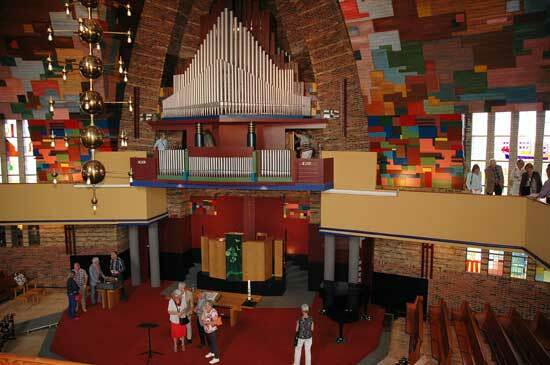 The interior is very colourful, with the result that the spatial effect of the high vaults is further enhanced. It is understandable that people quickly started to call the church – half-admiringly and half-enviously perhaps – the ‘Reformed Cathedral’, as the building has an unmistakably triumphant air. The triangular window in the similarly-shaped church façade provides the interior of the church with colourful, high-level indirect light. The sanctuary also receives daylight through the narrow, vertical windows that are installed along almost the entire length of the surrounding walls. All lines of sight are emphatically directed towards the pulpit, which is situated directly opposite the main entrance. This arrangement can probably be credited to the preference of Abraham Kuyper, who was the great leader of the Reformed people around 1900. In a series of articles, collected in 1911 under the title of Our Worship, he paid attention to all kinds of aspects of the church building, which was quite unusual in his circle. The architect arranged the open pipes of the organ in such a way that they harmonized with the sanctuary’s interplay of lines. He also made use of pipes of the instrument built in 1892 for the previous church building. In the 1960s the pulpit was adapted to the desire for lighter colours. By contrast the original, darker colours of the interior were reinstated as much as possible during the restoration in 2015. However, the enlarged podium was maintained for functional reasons, on which were placed a new communion table and baptismal font. The main vault’s lower reaches were painted with colourful geometric motifs that run upwards along the edges of the central wall. Even before the official inauguration, however, the church council arranged for this colourful brilliance to be softened by adding a transparent, whitish paint over it – apparently they thought that Reitsma had been a bit too artistically radical in this respect. During the recent restoration the colours have been restored to their originally intended brightness. The narrow and colourful stained-glass windows exhibit a continuous program, designed by Reitsma. They show stylized images of, for example, a farmhouse, a plowman, a ship, a lighthouse, and an airship; they refer to agriculture, trade, shipping and industry. These more or less symbolic motifs are interspersed with elements of landscapes. As a striking contemporary take on the traditional chandelier Reitsma designed a lighting system of glowing balls (see image 2). Looking back at the end of his life Reitsma considered the church in Andijk to be the high point of his architectural abilities. 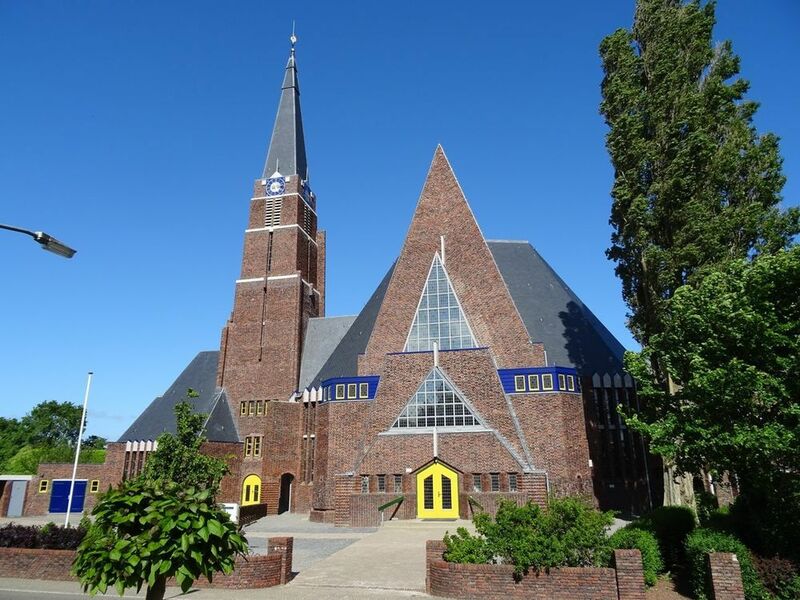 With his church designs from the interbellum he created a Protestant art deco. Egbert Reitsma: Reformed Church in Andijk, 1930. The above text has been taken with permission from Marc de Beyer, Albert Reinstra and Pia Verhoeven (eds. ): Kerkinterieurs in Nederland, WBooks in collaboration with Museum Catharijneconvent Utrecht and the Government Department for Cultural Heritage, 2016. Kees van der Ploeg wrote the text. It was abridged by Marleen Hengelaar-Rookmaaker and translated by Alida Sewell. Egbert Reitsma (Ulrum 1892 – Glimmen 1976). After his first internships with his father and lessons from the Groningen architect L. Drewes, Reitsma worked with the Hilversum architect and artist Jacob London and from 1917 until 1920 with the eminent Rotterdam architect Willem Kromhout, who recognized his great talent. Kromhout’s visionary architecture stimulated Reitsma to develop his own unique variant of architectural expressionism, as in his first big design, the Reformed Church in Kollum (1925). From 1922 until 1938 he was a member of ‘De Ploeg’ [The Plow, an artistic collective] i.a. as Vice-President (1922) and Secretary (1922-1923). Other expressionistic designs are, amongst others, the Parklaankerk, Groningen (1926, demolished 1989); Reformed churches in Appingedam (1927), Renkum (1927), Weesp (1928, burned down 1968) and, as the high point in his career, Andijk (1930). More restrained are the Pelikaankerk, Leeuwarden (1931) and the Noorderkerk, Bedum (1937). An important, non-ecclesiastic building is the Noorder Sanatorium with a director’s residence in Zuidlaren (1935). Dr. C.P.J. (Kees) van der Ploeg lectures at the Rijksuniversiteit Groningen and the Radboud Universiteit Nijmegen. His area of expertise is the History of Architecture of the Middle Ages and of the 19th and 20th centuries and Cultural Heritage.